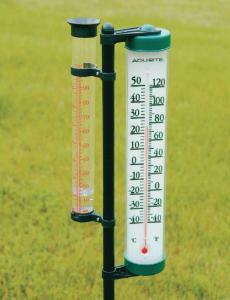 Dual-scale weatherproof rain gauge/ thermometer features swivel bracket for easy viewing. Thermometer measures in °F and °C; the 4" capacity rain gauge also measures in mm. The metal support pole separates into three pieces for storage and measures 42" assembled. The large digits are easy to read, even from a distance.